Delivers a wide range of benefits to all types of animals and life stages. 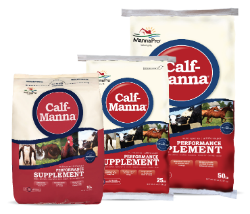 From horses, cattle, rabbits and goats to poultry, swine, and deer, Calf-Manna helps every animal reach their peak condition and top performance. High-Quality Proteins = More Growth: Includes multiple sources of high-quality protein. This protein provides a wide array of essential amino acids that meet the needs of many different animals. More proteins equal more growth and better muscle development. Digestible Carbohydrates = More Energy: An excellent source of energy. It’s often called “energy dense” which means it delivers more calories per mouthful. Our quality carbohydrates also make Calf-Manna an ideal solution for weight gain. Anise = Palatability: Provides inviting, sweet smelling aroma and taste for animals of all ages. The great taste encourages animals to stay on feed during times of stress like travel, illness, or environmental changes. Brewer’s Dried Yeast = Better Digestion: Improves palatability, encourages earlier and more consistent intake of dry feed, and promotes optimal digestion of other nutrients. Linseed Meal = Improved Coat Condition: Provides protein and oil to help add sheen and luster to your animal’s coat.